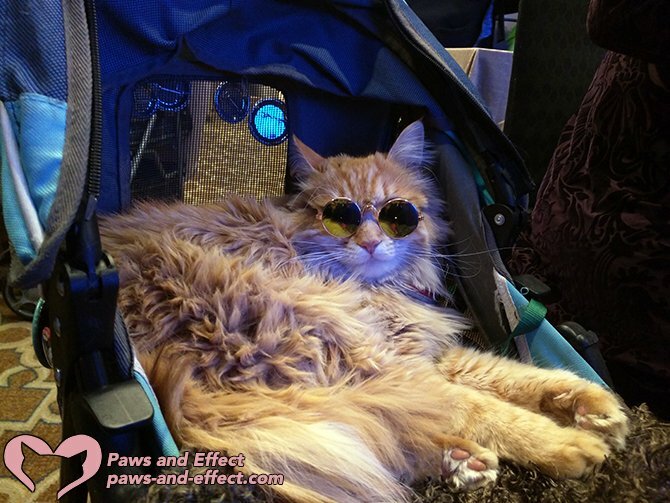 Samson the Cool Cat was one of the many feline guests at this year’s BlogPaws conference. Yesterday I returned home from the BlogPaws conference. It was an intense and wonderful–if bittersweet–experience, and I’m grateful I got to go, thanks to a sponsorship from the American Animal Hospital Association (AAHA). I got to see so many friends I haven’t seen in a long time, and to say my goodbyes to the people who started this amazing conference. This year marked the 10th anniversary of the conference that really gave me my official start as a cat blogger. 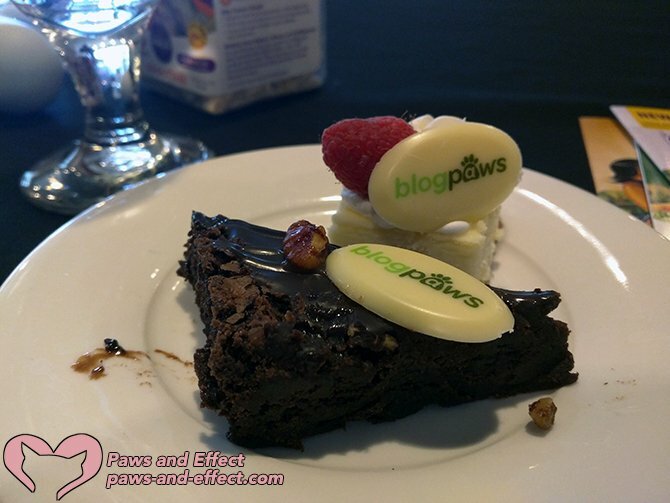 I’ve been writing–or I should say, the cats have been writing–Paws and Effect since 2003, but it wasn’t until the first BlogPaws conference in 2009 that I began to realize that bloggers are professional writers and that there are lots of things we bloggers can do to help get the word out about what we’re doing. As I recall, I sat on a panel discussion about search engine optimization at that first conference, but I had a really hard time coming out of my shell. Anyone who saw me speak at that panel would hardly have believed that I was almost too shy to even talk to anyone. But the founders of the conference went out of their way to make me feel comfortable and welcomed, and I really appreciated that. Summer, a Somali cat who appears in cat shows and works as a therapy kitty, was a guest at the conference. Her mama, a fellow Cat Writers’ Association member, and I enjoyed some good times together. Over the past 10 years, I’ve made some amazing friends and had some wonderful opportunities thanks to BlogPaws. I’ve been able to attend seven or eight of the conferences. The only two I missed were due to health reasons, and I’m sorry I missed those. 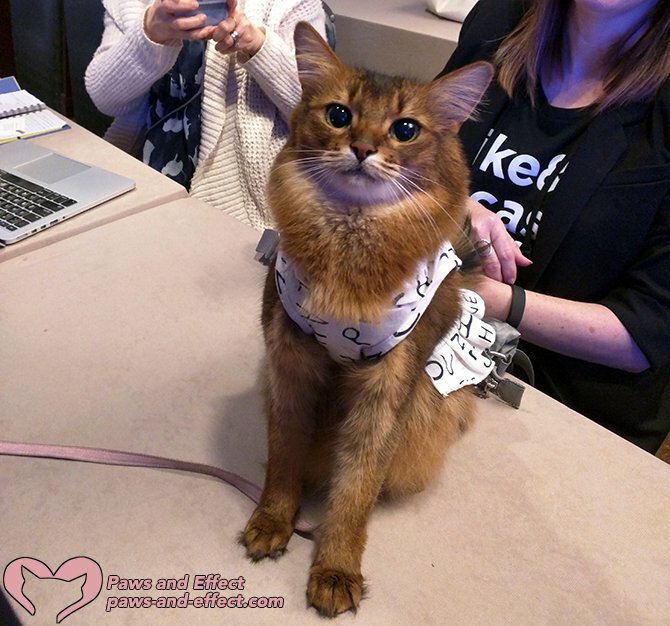 One of the greatest things about BlogPaws 2018 was the number of cats! Usually, dogs are the stars of BlogPaws, but this year there were more cats than I ever remember being at a conference before. 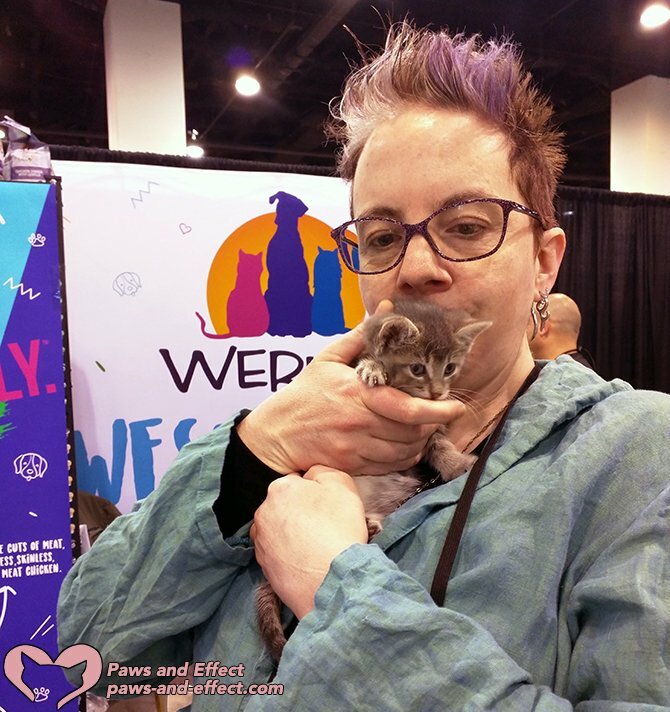 From the foster kittens at Wayside Waifs to blogger Jeanne Kudich’s cats, Coco and Chanel, to Summer of SparkleCat, and, of course, Coco the Couture Cat, who has made an appearance at every BlogPaws conference her human attended. As always when I travel, I missed Thomas, Bella and Tara loads and loads. I was fortunate enough to have a very good cat sitter to take care of them while I was away, but I certainly missed being surrounded by cats as I went to sleep each night. But I could sleep well, thanks to Caitlin and her care of the Paws and Effect Gang (and the photos and videos she sent me). Even so, it was an odd experience being cat-less. I had to resort to snuggling kittens to get my cat fix. Fortunately, Thomas, Bella and Tara forgave me. As usual, we were fed very well. I wasn’t sure how I, a vegetarian, would fare in the home of barbecue, but the hotel did a good job of having a variety of good veggie options. The snack bags BlogPaws put together also had vegan and gluten-free options for people who had those dietary needs. Naturally, the desserts were the stuff of legend. Cheesecake has always been a feature of BlogPaws conferences, and it’s been kind of a habit of us conference attendees to take some “food p*rn” photos of the desserts they provided. But the end of the conference was particularly bittersweet. Earlier this year, pet supply delivery company Chewy bought the conference from the original founders, who had nurtured it from a wild idea generated by another niche bloggers’ conference into a vibrant community full of passionate pet bloggers and microbloggers. As BlogPaws went on, we learned that four of the five core staff from the conference would no longer be working for BlogPaws, either because their positions had been eliminated or because they chose to seek other opportunities. Their addresses to us at the dinner after the prestigious Nose-to-Nose pet blogging awards left a tear in many eyes, including mine. I’ll never forget the friendship they offered me, and all the knowledge and tools they gave me to grow this blog into the venue it is now. Next year’s conference will take place in Florida, but the location and dates are still to be determined. 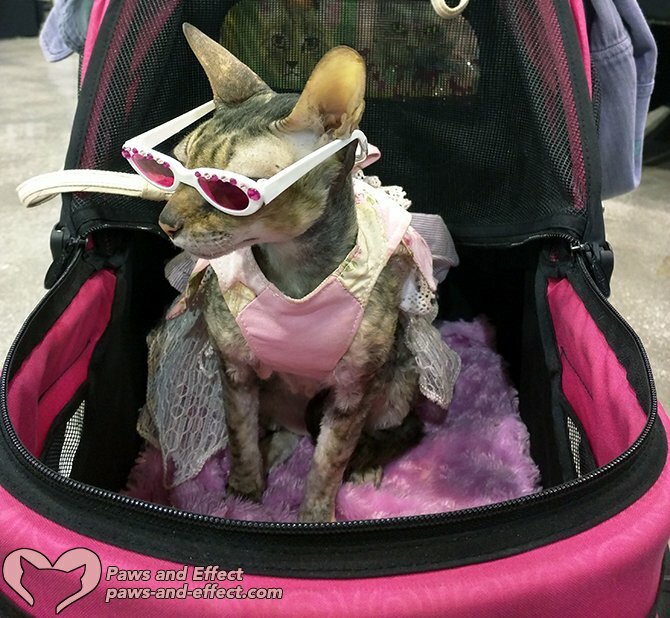 Will it be the same as previous BlogPaws conferences? No. Will that be bad or good? Yes. That is, some of the old passion that drove the conference to great heights will be gone, but hopefully the new chapter in its life will bring newer and even better opportunities. For now, it’s farewell to my friends and blogging family. Let’s all look to the future and see how we can grow together. I love you all! Paws and Effect wants you!